Well since crafting in this house has come to a halt, I have to dig back over the year and see what I have created. With all of my craft room packed away, it is pretty sad to not be able to create, but I am sure in the new house I will be busy for a LONG time with projects. Looking back through photos I came across a gift I made for my niece last year. She had recently received a play kitchen as a gift, so I searched for a child's chef hat and apron tutorial. I was happy when I came across both of them together here (hat) and here (apron). I used some strawberry fabric with red gingham to match (I made my apron reversible) and also added the name to the front center of the hat using wonder under and some solid red fabric. 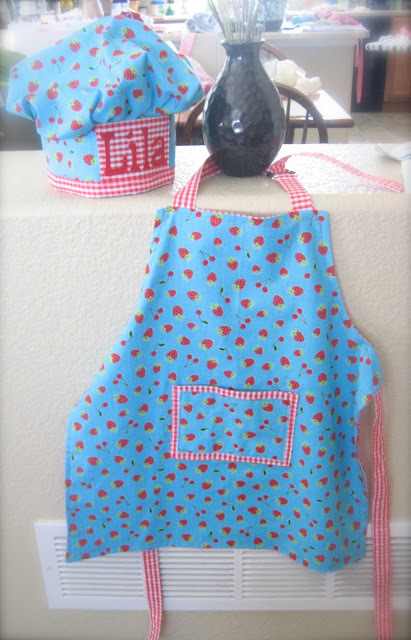 I think it turned out cute...but I have to caution you that this apron is sized for an older child. My niece was 2 at the time and it is way too big...had I been thinking I would have downsized it, but live and learn!